First of all, let me express my apologies for being away all this while. I never planned this hiatus to happen. But then man proposes and God disposes. right? I couldn't help but stay away from my kitchen and my camera for two reasons. We were hit by some kind of viral flu that refused to go way for two weeks. It was one of the worst flus to hit me. As a matter of fact, I am still recovering from the nasty cough. The second reason being, it is the month of December. It is that time of year when we take a vacation to India. So a lot of things are happening around the house. There is cleaning, packing, storing, shopping and more packing. So my life, for the past few weeks has been a complete roller coaster ride. Now coming to this recipe, if you are one of those, who celebrate Christmas during Summer, then this dessert is just the thing. 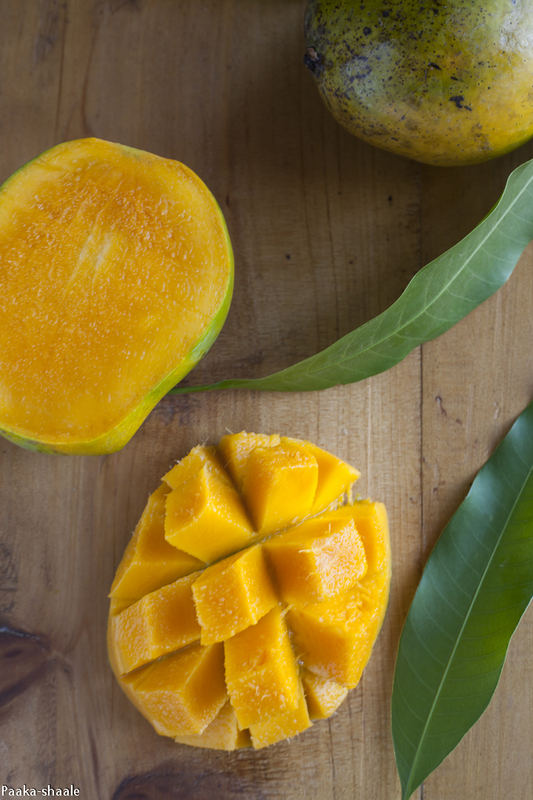 Right now, summer is in full swing in Tanzania and the produce of mangoes is in abundance. A few days back, my vegetable vendor got these extremely sweet smelling mangoes at my door step. I couldn't help but buy a dozen. 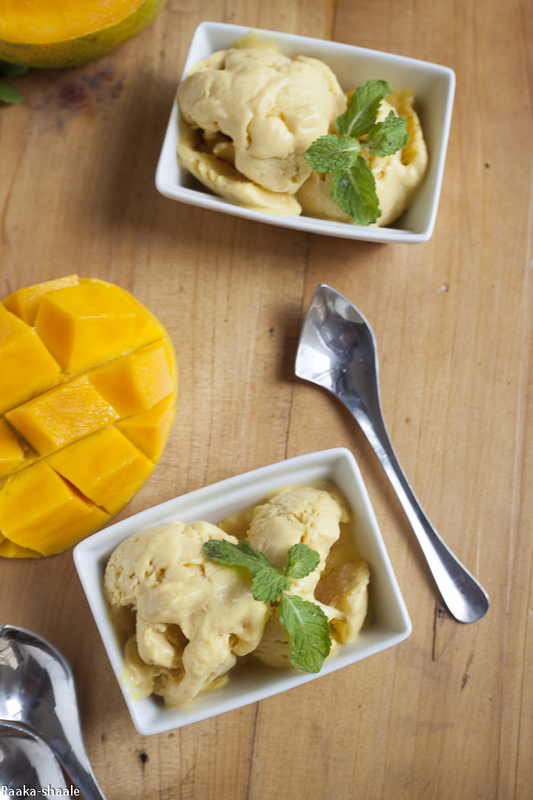 Under ordinary circumstances, I wouldn't have made ice cream out of the mangoes. 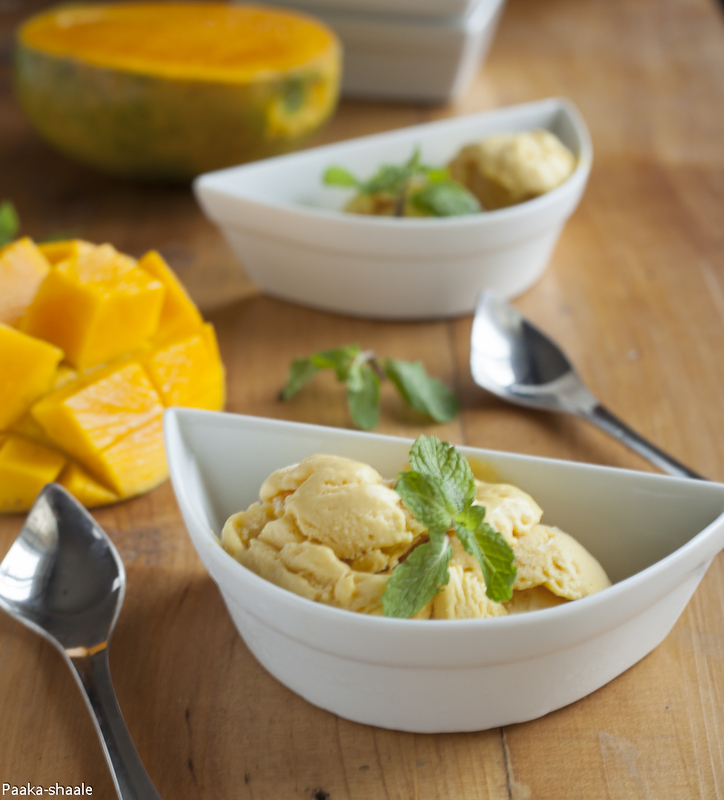 But Purvi had been asking for mango ice cream for a long time. She had been seeing this picture of Mango ice cream in one of Sanjeev Kapoor's recipe books. The recipe looked very easy and more over I had all the ingredients. So there I was making this ice cream. 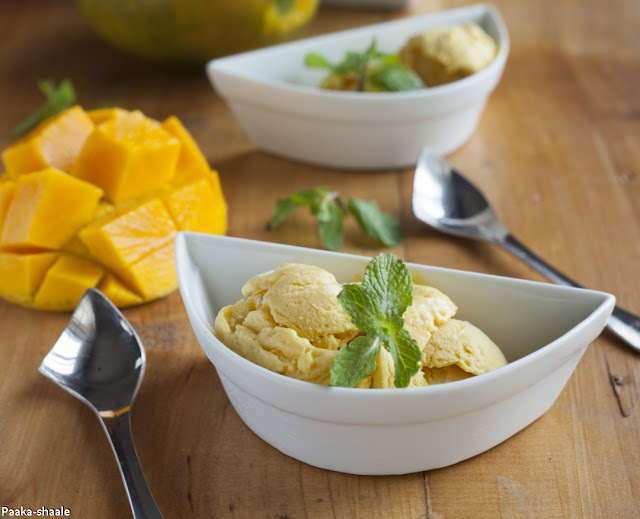 Although this ice cream is deceptively easy to make, the texture is rich and creamy. More like kulfi. There is something about this sweet scented aromatic fruit. 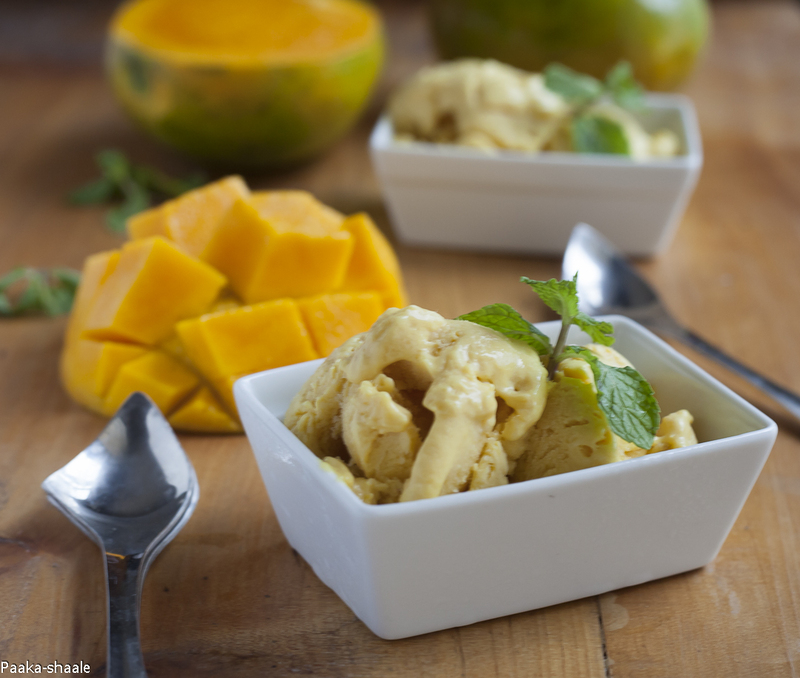 It imparts a luscious texture to this frozen dessert. All you have to do is give this ice cream a lick and you will fall for this hook, line, and sinker!! Remove the ice cream to a blender and blend till smooth. Transfer the contents back to the air tight container and freeze for 5-6 hrs till completely set. If the mango pulp is very sweet, reduce the amount of sugar. You can use a cup of any size. Just make sure to use the same cup to measure all the ingredients. Its really very easy to make n im going 2 try this tmrw..Thanx 4 recipe. 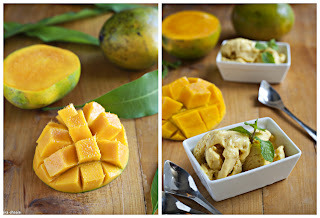 mango is my fav and this looks very tempting!! Yummy looking mango ice cream, one of my favorite flavors. Enjoy your trip to India. Omg, mango icecream..Love it..Missing mangoes now. So sorry you were hit by the flu! It appears to be a worldwide phenomenon as we were also hit pretty hard by it not too long ago. Stay healthy my friend! The ice cream looks fantastic! Divine! That is such a great flavor. Neat space you have here...Icecream looks awesome and hope you all are doing better now. It seems really nice and refreshing! I will have to try to do it at least once! Great knowing how to make home ice cream during thest HOT days.